I am honored to be a part of National University, which is committed to lifelong learning and helping students achieve their education goals. The dedication of our students inspires me to continue to find innovative ways to ensure their academic success. 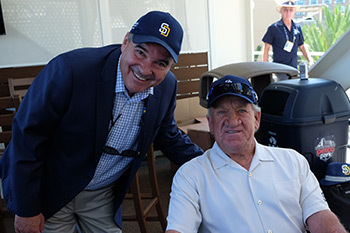 Dr. Andrews with Padres great – Randy Jones. I’d like to congratulate Dr. Gangaram Singh, who has been named Provost of National University. Dr. Singh is an award-winning educator, who is passionate about providing an exceptional student experience. While Provost Singh will work with our outstanding faculty members, who share their knowledge with our students and support them first-hand, National University’s commitment to student achievement extends well beyond the classroom. Recently, Chancellor Cunningham and I traveled to Washington, D.C., where we had the honor of meeting with veteran organizations to discuss NU’s critical role in providing a high-quality education to veterans. At National University, one out of every four students is associated with the military, either serving active duty, as veterans, or as family members of those who serve. We also met with congressional members and their staff to reiterate the same message and advocate for all adult learners. Furthermore, on July 17, I was thrilled to honor the ten recipients of the National University Military Scholarship at Petco Park. This is the third year that National University has partnered with the San Diego Padres to recognize the academic success of military and veteran students with these scholarships. I am proud of these students who excel in their military careers and are now excelling in their academic careers. I enjoyed learning about these students’ diverse backgrounds and hearing what led them to pursue degree programs, such as Public Health, Cyber Security and Information Assurance and Business Administration. Learn more about this year’s scholarship winners. I was especially honored to be interviewed on KUSI alongside one of our scholarship recipients, Catherine Turner, who is in our accelerated Vets to BSN program. 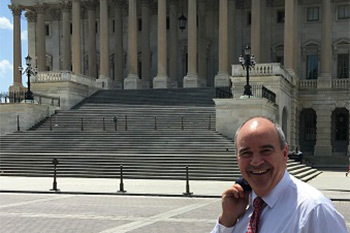 Dr. Andrews visits Washington, D.C. to discuss higher education with veteran organizations. In addition to supporting our military community, National University is dedicated to empowering and supporting current and future educators. With the new K-12 school year quickly approaching, we are thrilled to be one of the co-hosts of the 2nd annual Better Together: California Teachers Summit on July 29. There is no cost to attend this summit and it is open to all California teachers, teacher candidates, and school administrators. With 38 locations statewide, it provides a great opportunity to network and learn effective strategies for implementing the new California Standards in classrooms. National University is one of four universities hosting the event in San Diego, and we invite all San Diego teachers to join us from 8 a.m. to 3 p.m. at the Town and Country Convention Center, located at 500 Hotel Circle North. My background is in education and I am excited for the opportunity to meet with and hear from some of the amazing educators we have in San Diego and statewide.